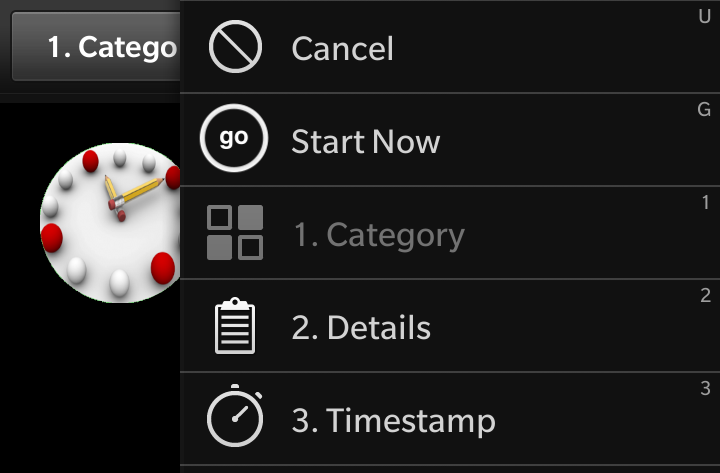 Please take a look at the workflow in ‘Strict’ Mode – explained in detail here. All works well and looks great on Touch Device and I have tried to minimze the Touch Gestures / Taps you have to do while starting a new Tracking. 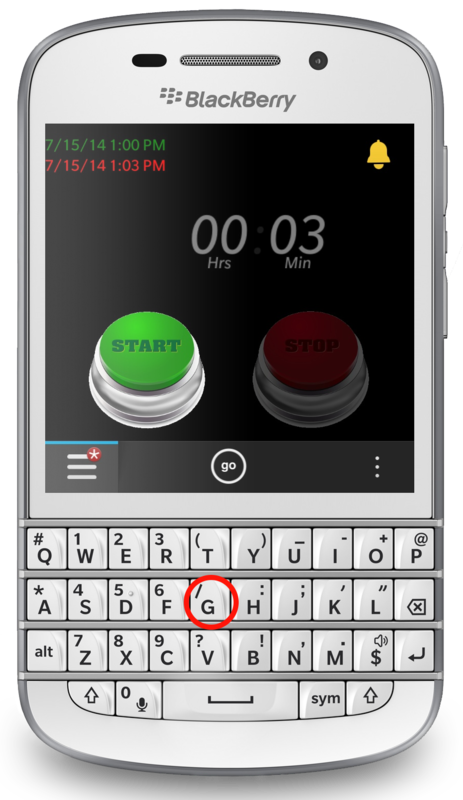 Same will also work on a Keyboard Device like Q10 or Q5 – demonstrated in detail for ‘Free’Mode here. hmmm – there’s a keyboard integrated – can we do it even faster ? Yep ! imageSource: trackedTimeContainer.running ? "asset:///images/stop.png" : "asset:///images/go.png"
This Action is a Toggle between Start and Stop, so there are two different titles, Icons and also ShortCuts. 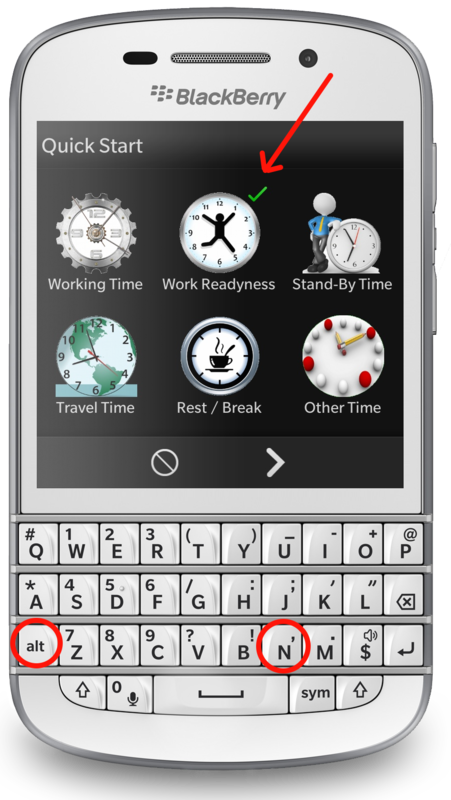 surround the Key with qsTr() – then you can translate the key into different languages. It’s not an easy task to find unique letters through the app – esp. because there are some default keys already used (and translated) by the System to Edit, Zoom, Delete etc. Take a look at the documentation. 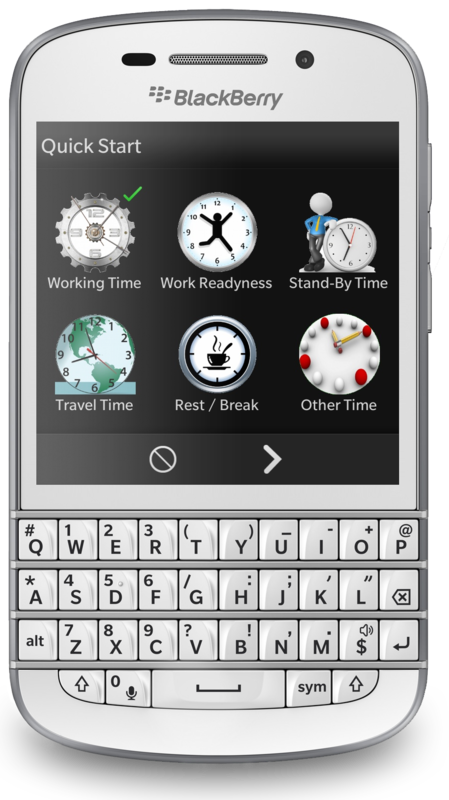 The Selection Marker was moved from ‘Working Time’ to ‘Work Readyness’. Typing alt-n again and again the Marker will cycle through all Categories. Then typing ‘G‘ you can Go On to the next Page – typing ‘U‘ you can cancel (Undo) the workflow. Only different: ‘U’ (Undo) is a predefined SystemShortcut, where ‘G’ is a custom Shortcut. Categories are displayed using a ListView with a simple ArrayDataModel. Besides the Category Icon there’s a green Marker Icon, This Marker Icon is only visible if Category Id == selected Id. ‘G’oing on opens the next Page with details. There are no or up to three Input Fields on the next Page: Project, Order, Task. It depends from Settings – Categories which fields will be displayed. To enter data on a Touch Device you simply Tap on the field and enter the data. On a keyboard device it would be nice to enter data immediately without tapping into a field. That’s the reason why we need requestFocus(). I’m checking if the field is visible and also if there’s already some text typed. 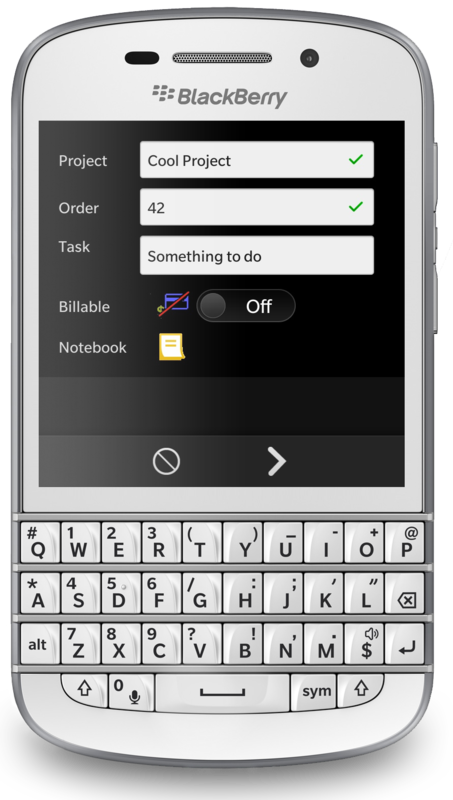 If visible and field is empty User can start typing immediately. I really recommend every developer to think carefully about using Shortcuts to simplify workflows or speed things up: BlackBerry Business App Users want to be productive ! Posted on 2014/07/12 2014/07/15 by ekkescorner	This entry was posted in Adapt. Bookmark the permalink.